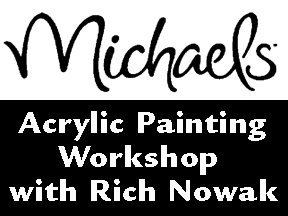 RICHARD NOWAK FINE ART: Last Saturday Michaels had their Open House and my acrylic painting classes were half price. Such a great value! Had some sign ups. Michaels has extended the discounted pricing for this entire week. Simply go to the Hadley or West Springfield Michaels and sign up for my classes at the register for this discounted pricing. Last Saturday Michaels had their Open House and my acrylic painting classes were half price. Such a great value! Had some sign ups. Michaels has extended the discounted pricing for this entire week. Simply go to the Hadley or West Springfield Michaels and sign up for my classes at the register for this discounted pricing.